Computes a vertex coloring for the vertices in the graph, using a simple algorithm . Given vertices ordered v1, v2, ... , vn, for k = 1, 2, ..., n the algorithm assigns vk to the smallest possible color. The algorithm does not guarantee an optimum coloring. 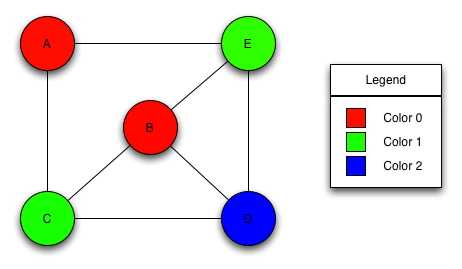 Here is the coloring that would be produced on a graph given the vertex ordering A, B, C, D, E.
The graph object on which the algorithm will be applied. The type Graph must be a model of Vertex List Graph and Adjacency Graph. This property map records the colors of each vertex. It must be a model of Writeable Property Map whose key type is the same as the vertex descriptor type of the graph and whose value type is an integral type that can store all values of the graph's vertices_size_type. Python: Must be an vertex_int_map for the graph. A mapping from integers in the range [0, num_vertices(g)) to the vertices of the graph. Default: A property map ordering the vertices in the same way they are ordered by vertices(g). The time complexity is O(V(d+k)), where V is the number of vertices, d is the maximum degree of the vertices in the graph, and k is the number of colors used.